This entry was posted on September 24, 2012 at 11:14 pm and is filed under Choir Ministry, Church Music, Congregational Singing, Leading Worship, Music Ministry, Singing Worship, Spiritual formation through singing, Worship Leaders, Worship Pastors, Worship Reminders, Worship theology, Worship thoughts, Youth Worship. You can subscribe via RSS 2.0 feed to this post's comments. I appreciate Bruce’s desire for unity in the church and I think it’s a worthwhile endeavor that all who shepherd should pursue with vigor. Bruce argues that unity is built around a shared experience yet he only focuses on a shared experienced of music “sameness”. For churches that have multiple services, preferences are already part of the worship services as people make a choice based on a preference of what time they attend a worship service. According to Bruce’s argument these churches do not have unity because they do not have a shared musical experience. I would say that now we’re just arguing over the degree of unity or disunity that churches have. Full disclosure, at my church we have 7 services in 5 venues using several different musical styles. There are other things besides the music style that make each service or venue distinctive including dress, architecture, coffee or not, chairs or pews, english or not, etc. However, we have made the decision not to build a $25 million dollar building large enough for our entire church to worship in one room at one time. We choose to unite around something greater than music style or cultural expression. We spend our time and effort as pastors encouraging unity among our people around the gospel and the mission God has called us to. Primary issues should be what unite us, not tertiary ones. I will be the first to admit that we do not have it figured out and are seeking God every day as we attempt to lead a church growing very rapidly. I agree with Bruce’s assertion that a church small enough to meet together in one room at one time would be best served using a convergent style but I believe that ultimately there are larger issues to unite over. Not sure I grasp your pushback. I admit I cherry-picked Bruce’s article (with his permission) to underscore the power of the Gospel to be the priority – not at all musical style and certainly not “sameness.” In fact, the very thing you indicate your church chooses to unite around, with which I would concur wholeheartedly given what I know about you, your staff, and your congregation, is what I hear him saying, though his scenario is in one service where diverse songs are shared in diverse styles, whereas yours are in multiple services and styles. Whether we are a church meeting in “7 services in 5 venues using several different musical styles,” or we are a congregation that, following a devastating bombing attack two blocks from our building that shattered our windows and our hearts, is recovering in smaller numbers but with enlarged hearts that are more fully welcoming to people who look different, struggle with different life issues from what we have been use to, still our worship rallies around a Gospel of Jesus, which is indeed primary, not tertiary. I think there’s another dynamic at play here; not so much one that makes you both “right,” but that certainly is explanatory. Though probably not satisfactory. First, a little disclaimer: my parents attend Collin’s church, and they are very happy there. Probably the first church my dad has attended in… like… EVER, where he didn’t complain to me about the music. 😉 Their solution to “population control” is not the only one in that community, and that, I think, is where the application of Bruce’s thoughts are problematic. Within a church context, Bruce is right, I think: not that music be homogenized, or in pursuit of “sameness” (not, I think, what he was saying in the first place), but that a body of believers experience unity in as many aspects as we can control (I’ll wait for your knowing chuckle). We must present a unified sense of worship (not a plain “same” style) to lead our people to God’s throne. However, in a multi-service (and even multi-site) context, this is challenging. As Collin has said, some churches are effectively split depending on when and where to worship. In this sense, it really isn’t about worship; if such can be imagined, there is a deeper issue. I don’t want to denigrate anyone’s congregation, so I won’t risk being so stupid as to suppose motivations. The point is, if a church isn’t unified for something like time and place, music is the least of the problems. It may be the excuse, but not the inherent cause. HOWEVER however, in Collin’s context, space is an issue. There have been some churches that have solved that problem by moving to another area. To their credit, Collin’s church has bloomed in the community in which it was planted, and serves the people there well. The solution they’ve chosen is not original with them, and it may be debated separately whether this technique of church growth is the best or not. As he stated, this is the solution they’ve adopted. In that context, however, Bruce’s point becomes all the more evident: many people are as much picking their church as which service they go to, frequently based not on how they can serve God with that congregation, but on “what they like.” Hence, food court worship. Again, music is a tertiary consideration, even if it’s given credit as the deciding factor. 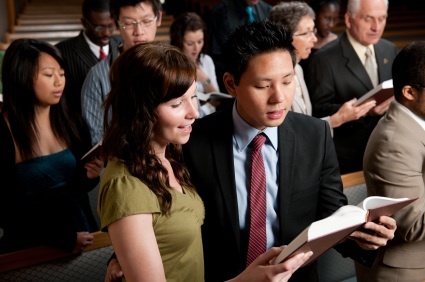 A careful look at the New Testament solution indicates the seeding of “daughter” churches. I get that multiple services and “multi-site” plants allow for more control over orthodoxy, but I’m not sure that was the concern in the early church. The Gospel was the primary factor, and there was (of necessity) a lot of faith and reliance placed in the Holy Spirit to keep the integrity of the message in line. Thanks for chiming in Michael. This is all healthy conversation, especially among worship music leaders like Collin and you (and Bruce and I trust, me for that matter) who take very seriously the larger picture. Great word Paul! I agree with you totally. This is something I have been preaching for a few years now. Hopefully these ideas will emerge into a movement among our churches.